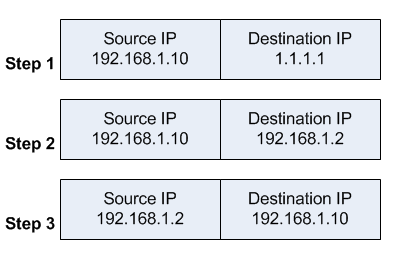 the server replies to the client’s request and the reply packet has a source IP address of 192.168.1.2 and a destination IP address of 2.2.2.2. 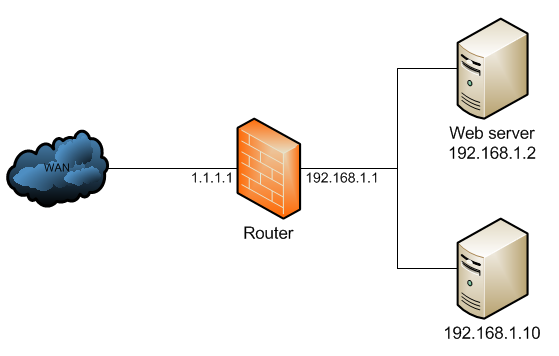 When a client on the same internal network as the web server requests a connection to the web server’s public IP address, the connection breaks. the server replies to the client’s request. 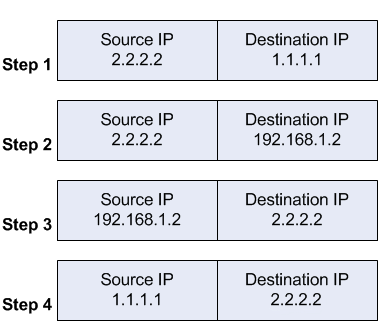 However, the source IP address of the request is on the same subnet as the web server. The web server does not send the reply back to the router, but sends it back directly to 192.168.1.10 with a source IP address in the reply of 192.168.1.2. 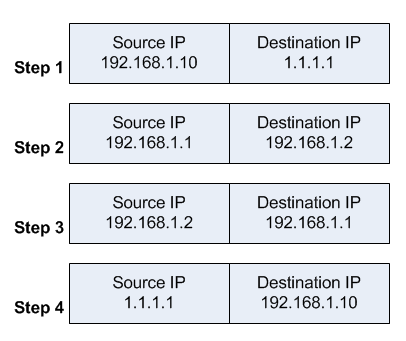 To fix the issue, an additional NAT rule needs to be introduced on the router to enforce that all reply traffic flows through the router, despite the client and server being on the same subnet. The rule below is very specific to only apply to the traffic that the issue could occur with — if there are many servers the issue occurs with, the rule could be made broader to save having one such exception per forwarded service. the web server replies to the request and sends the reply with a source IP address of 192.168.1.2 back to the router’s LAN interface IP address of 192.168.1.1. However, the web server only ever sees a source IP address of 192.168.1.1 for all requests from internal clients regardless of the internal client’s real IP address. There is no way to avoid this without either using a router that can do application level DNS inspection and can rewrite A records accordingly, or a split DNS server that serves the internal clients the internal server IP address and external clients the external server IP address. This is called — among other terms — hair pin NAT because the traffic flow has clients enter the router through the same interface it leaves through, which when drawn looks like a hair pin. Запись опубликована автором Igor в рубрике Люди. Добавьте в закладки постоянную ссылку.